A planned gift has an incredible impact on the work of Water Mission. Leave a legacy of hope for children and families in need of safe water by joining the Legacy Society through a future gift to Water Mission in your will or trust, or other estate plans. It’s essential to take care of your family and loved ones first. Yet many find great satisfaction in expanding their future plans to include missions and ministries that are important to them. If you would like to extend the impact of your generosity beyond your lifetime, there are many ways to do so. Set up a permanent life insurance policy with the insurance company of your choice. 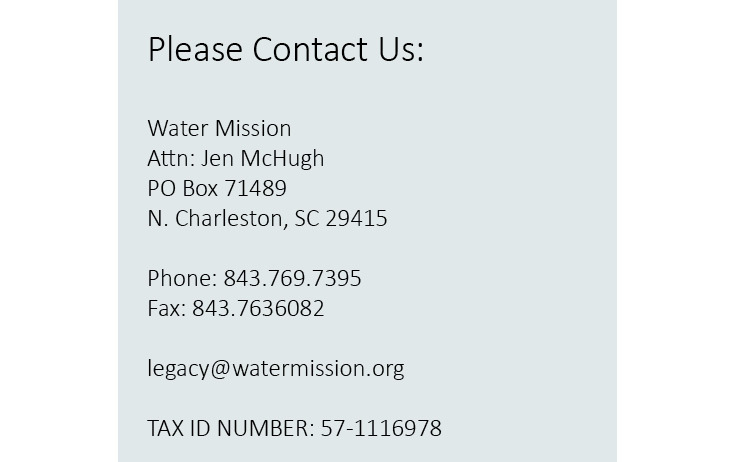 Name Water Missions International as a beneficiary of your life insurance policy, or assign the policy to Water Missions International and use the cash value as a charitable deduction. Name Water Missions International as a beneficiary of bank accounts or securities.